Our product categories show a wide variety including FOSHU and Foods with Function Claims as well as general health foods to satisfy every need. Based on evidence assured by our R&D expertise covering everything from raw materials to finished products, as well as total consulting skills from product planning to sales promotion support, we provide high-quality health food products. We support our clients at every step, individually and totally. Business strategy planning. Planning and development of new products. 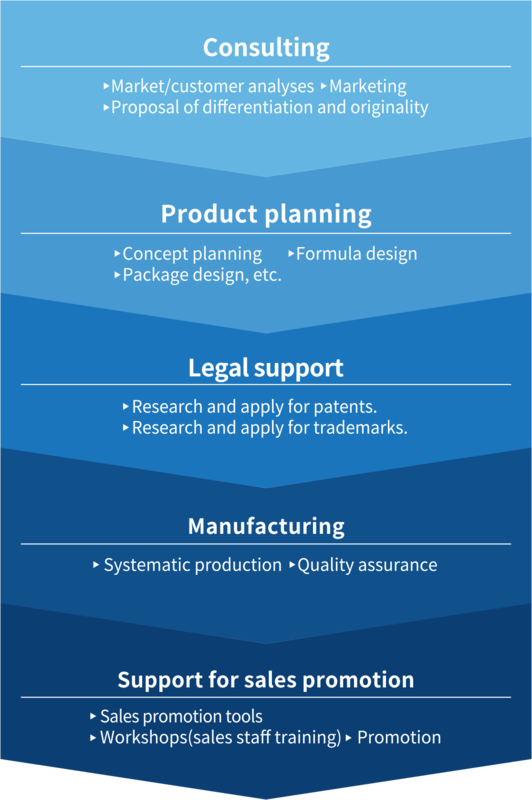 Planning of sales strategy of products and ingredients. Support for sales promotion and exploitation of sales channels. Renewal of products and ingredients. Our first step is to listen to your requests and strategies. Based on the information we obtain from them, we then propose business and marketing plans. We examine products specifications from various aspects, such as taste, texture, functionality, and originality. While we seek to enhance the added values and appeal power, we also pay great attention to product designing that considers also cost, stability, and other important aspects. The shape, size, and material of the package need to be determined with consideration for the functionality to avoid deterioration of the content, adaptability to the production line, and durability for the package to be delivered to consumers without any stain or damage. As TOYO SHINYAKU has our own factories, where the prototype production and mass production are available, we are able to ensure the functionality and product line adaptability at early stages. We have established a division specializing in intellectual property management in order to obtain patents for ingredients and formulation techniques, and to protect our brand by registering trademarks. In addition to protecting ourselves, the division also protects our customers’ rights. We are the first comprehensive contract manufacturer registered as an NSF GMP and have been imposing strict quality management standards upon ourselves. The factory has a full production system consisting of a pulverizer, granulation equipment, tablet press, and filling and packaging equipment. We believe that the safety and efficacy are required to be ensured for the health foods. 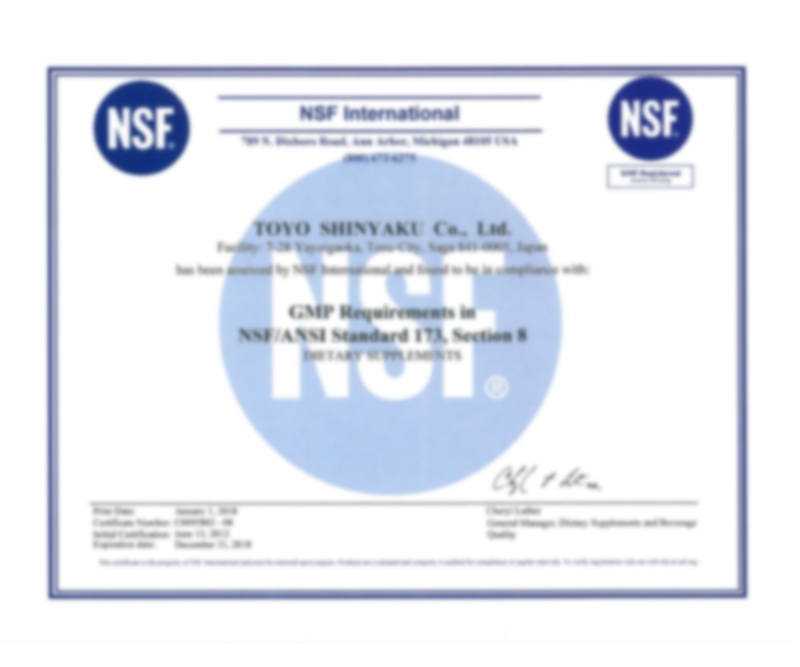 We are the first comprehensive contract manufacturer registered as an NSF GMP (the US Standard for appropriate management of production, packaging, display, and storage of dietary supplements)and also obtained JHNFA Dietary Supplement GMP certificate, and ISO9001:2015 and ISO22000:2005 to ensure even safer operations. We improve the production environment from the hardware aspect including facilities made of 100% stainless steel, air showers, and atmospheric pressure management, as well as setting the strict standard on the software side. Ingredients are lot controlled from the purchasing stage to ensure its traceability, and all products are inspected for foreign matter after packing. We support comprehensively for “the construction of a mechanism to sell product” including planning sales strategy such as sales channel selection, sales system establishment, and distribution route expansion, and communications such as point-of-sale promotion, promotion material creation, advertisement and publication, also training for sales staff and creation of sales manual.